Welcome to another packed newsletter….. In this issue we feature the following……..
Australian weight increase to 544 kgs MTOW approved !! You read right….. The AUF advised today that the only thing left to do is issue the certificate for the Sinus to be approved for flight at up to 544 kgs in Australia, this is great news especially for those heavier pilots who wanted to take a passenger and luggage. Following on from our success with the X-Air group we have just launched a support website for owners of the Sinus and Virus aircraft. The group is basically run by aircraft owners and its an ideal forum to swap ideas, trade stories and generally discuss the pleasures of owning these fantastic aircraft. I encourage all owners to join, the more who contribute the more depth and resources our group will have. Exciting news….. If your going to AirVenture 2003 be sure to drop by site 405 in the Northern Aircraft Area to say g’day. We will have lots of information about the Sinus and Virus Motorgliders and we are accepting orders for the aircraft with the announcement of Sport Pilot and the Light Sport Aircraft Category expected to be only a few months away. If you want a good chat, one-on-one we have found the best times to come by is during the airshow in the afternoons. Unfortunately we wont have a Sinus or Virus on display this year but we will have brochures and a video running throughout the day. Please drop by…..
Our first Virus is due for delivery on the day we leave for Oshkosh, our return on the 8th August will see the plane take to the skies shortly afterwards. If your Australian based and would like to inspect and fly the Virus please drop me an email at mcoates@mcp.com.au and we will make arrangements with you on our return. 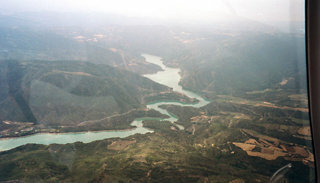 Could an Ultralight Aircraft fly from Italy to Portugal in one single day? Yes, it could be done easily with a Pipistrel Sinus! 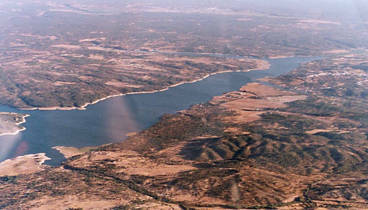 Potrugal’s Antonio Manuel Alves flew from Pontedera (Toscana, central Italy) to Lisbon, (western capital in Europe)! Following are Antonio motivations and impressions from this challenging trip. Dreams could become reality within this spacious, quiet and comfortable cabin even after more than 10hours of continuous flying, I still fell great and ready for at least another 10 hours. This aircraft was not only love at first sight but after 400 hours in six months the more I fly it, the more I enjoy it. I love conventional gliders but being dependent of a launching team wasn’t part of my dream. Naturally I became attracted to motor gliders, but there are not many on market. To pick an aircraft with enough performance and in a price range to satisfy my desires of long distance flying and easy operation the choice became almost impossible. The Stemme looks pretty nice but they are too expensive for my budget, I also found with the bigger wingspan they are difficult to find a hanger and difficult to operate in very small airfields. Even the Dimona’s and Ximango’s are comparatively too expensive to buy and operate. Then in 1998 the Sinus appeared in some magazines and it looked a serious candidate, something that on paper could satisfy my requirements. Its performance per cost was clearly superior to all the competitors for glide and soaring, long range ability and fast travelling speed, it also had the ability to handle small airfields and it was comfortable to sit in. In my mind the only competitor was the Stemme’s clearly superior soaring ability (1:50), but glide meant nothing to me in cross-country traveling. After months of research there were no other aircraft that could compare with the Sinus’s attraction and fulfil my requirements like this aircraft did. This research took me to Slovenia to visit the factory, look over the production and most importantly fly the aircraft. Bad weather and strong mountain winds didn’t permit the test flight on this trip and also the delay of more that one year for delivery was too discouraging for me on the day I visited but I walked away still with the desire to own one of these aircraft and I knew that after a few more months the delivery delays would be reduced. 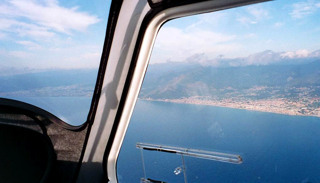 My participation in the 2001 World Air Games in Spain had me flying against and close to the Sinus every day; it became distracting to fly against the object of my temptations. Fully loaded for the trip, my companion the fuel can !! Confirmation of the Sinus performance was well demonstrated by Phillipe Zen who went on to win the event by a comfortable margin, the performances of my old Mistral was not at all comparable, this was the decisive moment which made me commit to my purchase of a Pipistrel Sinus. 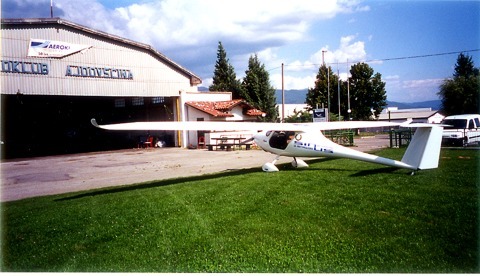 Many people still look at an Ultralight registered aircraft as a very primitive low performance, simplistic, fragile or even dangerous aircraft, therefore it seems important to me to prove the Sinus performance and reliability and complete this trip in a single day, demonstrating what is my idea of the evolution and the performance capabilities of a modern Ultralight Aircraft. 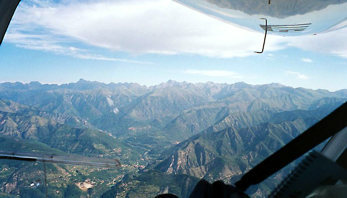 I also wanted the opportunity to fly around Europe and learn more about this area so I made arrangements to spend at least a week flying around Tuscany with incursions to South Italy and North into the Alps mountains, this provided a great training program and a made for a comfortable adaptation to the aircraft from the lower performance aircraft I had owned before. Then my friend Maximilliano came up with the idea of filming the Sinus flying in the mountains, lakes, and beaches with me and the plane being the main actors! Fabbrizio and Max followed in another Sinus with one door off and the cameras rolling to capture the adventure. 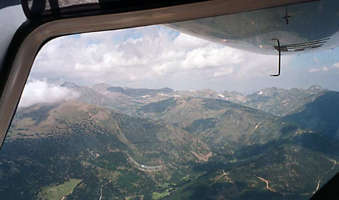 The weather was great and this area of Europe has the best of mountains, plains, and nice beaches to fly around. The Tuscany region and people are also very special, they reminded me of my childhood region and I felt like I was at home, also the people and language are quite alike. I had such a great time that it will be a pleasure to revisit this region, probably next summer to ferry a Virus to Portugal. We all have dreams, and some of them have wings to fly. I am so happy with this aircraft that I will fill egotistical if I don’t share my experiences with this wonderful flying machine to the people who love flying. If you don’t have a lot of flying experience it may not make much sense to attempt such an adventure in long distance flying, there are too many situations to deal with. 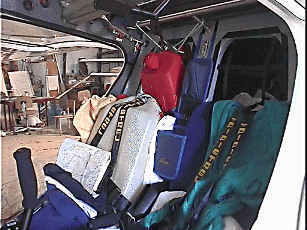 This is an amateur activity and we usually don’t have all the staff and specialists the professionals and military have to rescue, support, help, prepare and brief you about all complexities to deal with for such extended distances, danger areas and restricted air spaces to avoid; as an Ultralight pilot we must do this all by ourselves. Today there are many electronic and navigation wonders that could help but they are also very demanding to master and possibly less reliable than the old ones, I mean with all the info through computer networks, portable phones, the internet, GPS computer maps, storm scopes, electronic instruments and so on I did this trip with a compass and maps. 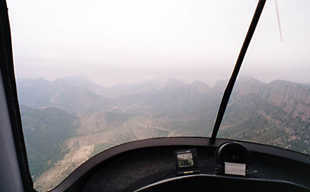 I avoided as much as possible flying without having an aerodrome or good terrain at glide range for safety, It’s why I needed to fly high and this meant as high as possible. The usual practical limit is 10 000 feet, but again with the proper oxygen equipment, trained and approved pilots, it’s possible to go higher, again not for amateurs. 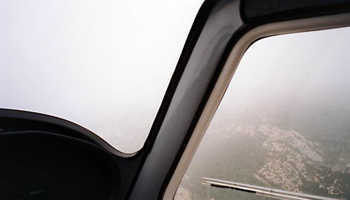 Local authorities usually demand that you carry a certified radio and mode C transponder, and have the aeronautics licenses to operate the equipment when you try for these higher altitudes. I checked through the Internet the night before travel to see if weather forecast along the course will be within limits. It looked reasonable but it showed that the following days would probably not be much better so I made the decision to leave the next morning. Despite me giving the hotel advice that I will need to leave early in morning they took a long time to ready the account because of my one week stay there. I arrived the airfield at around 7:30 am but fog prevented me departing as soon as I had the aircraft ready. At around 8.30 am I decided that it’s finally safe to leave Pontedera. 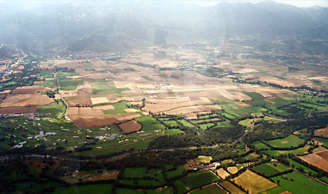 After takeoff I flew between the Tassignano and Pisa restricted airspaces through the beautiful mountains of Massa Carrara, famous for the old known marbles and had the coastal line in sight. The fog became light rain and eventually water was all over the windows and the visibility does not great, but if the forecast was right it should dissipate some 150 km ahead. 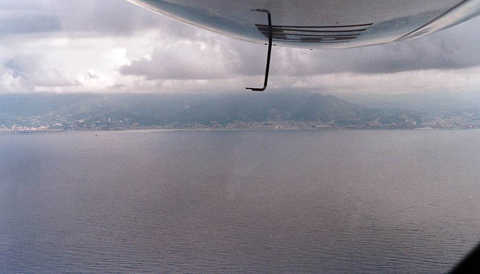 To reach the promised clear sky areas I needed to deal with the mountains on my right and on my left with the restricted and danger coastal areas of La Spezia. I tried to keep an eye on the small but empty beaches as landing places just for my peace of mind. 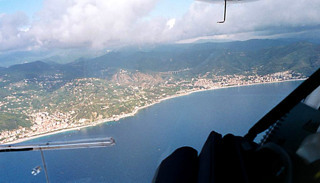 It was really hard flying there because I couldn’t go through to the coast because of the restricted areas going far out into the Mediterranean Sea. These restrictions forced me to go around and through a valley and return to coast and all around mountainous terrain, a very unpleasant detour. But this was the only legal way to transit this area. Next a sequence of nice seaside places passed under me like Sestri Levante. At this time I needed to decide how to pass around Geneva air space. The cloud ceiling is around 1500ft, to low for the mountains, my only way through is towards the sea at low level again another uncomfortable situation. I could see Geneva airport at distance and some ferryboats on the water. 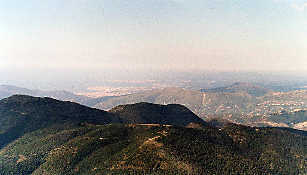 Then ahead Savona and Albenga and the comfort of more beaches and seaside places and the clearing sky. 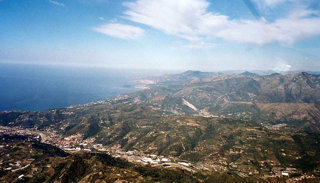 Imperia, San Remo and Ventimiglia near the French border, all nice places by the seaside, with lots of mountains, houses and nearby marinas and boats. Now I have ahead the Monaco and Nice crowded air spaces, and at left the Alps. The clear skies promised a safe tour trough these high mountains and looked an irresistible route. 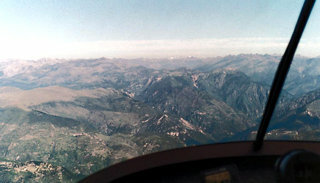 I flew to the North went around Cime du diable, through Alps Maritimes, Mt. Mounier, Mt. Pelat at 11,000Ft. 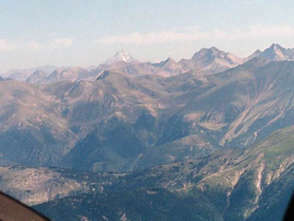 I then passed nearby Barcelonnette and go Hautes – Alps (4103m – 13,450Ft) I recognized 50 miles away the Mont Blanche at (4810m 15,770Ft) and that was enough heading North, now it will be West to my destination. Heading West through the interior of France and avoiding the crowded, restricted and controlled air spaces was a challenge but it proved to be one of the most tranquil parts of the entire flight. Still some mountains, but nothing comparable to Alps, the air is calm and my speed is high. The peaceful time came quickly to an end when I realized that I needed to prepare to cross the Pyrenees with bad whether. I could already begin to see that a barrier of clouds from South to North will be a problem demanding all my attention. I ate a sandwich, some fruit and yoghurt and very cautiously began to transfer 25liters from the Jerry can to the right tank which was almost empty. Everyone must be aware about the real danger of working with fuel in an environment were static discharges in very dry air due to altitude and others perils demand extreme care and specialization. It’s nearing 12 o’clock and I am 3.5 hours into my trip. In the forecast I received last night it seemed better through the North than South, but from 150 km out both seemed equally as bad. The terrain, roads, and my familiarity with the nearby Andorra part of Pyrenees will be my choice to explore the possibility of passage. 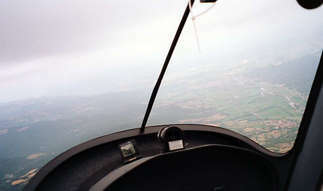 I know three good airfields to land in this region, and the sites to pass, however the clouds block almost all passages. 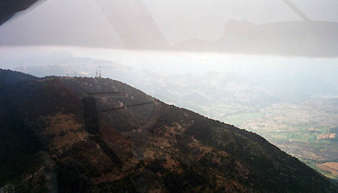 Approaching near the Andorra border road entrance I confirm that clouds had arrived first and block that route too. 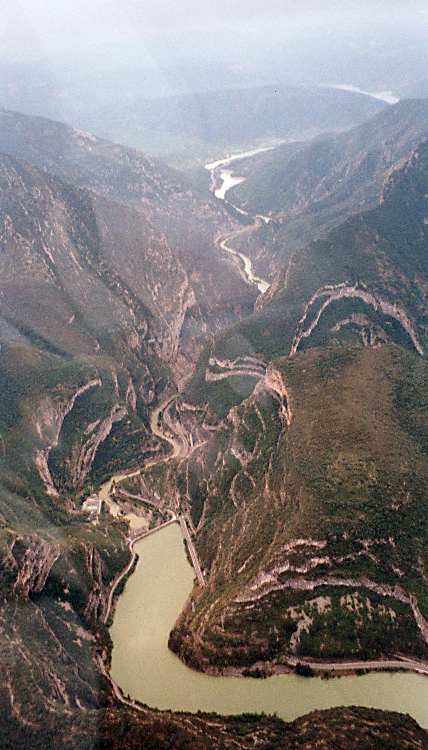 I have been through this region before and know the passages of the South Alp valley gaps. 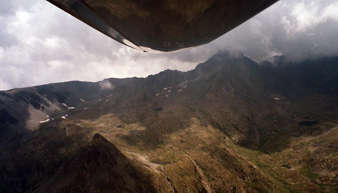 The wind is beginning to strengthen and that forced me to fly carefully in the exposed wind side of mountains to avoid the strong turbulence, speed is now reduced to around 140 kmh, I found the passages near the old border between Bourg Madam / Puygcerda through Alp aerodrome valley. It’s a nice airfield for gliders but today it’s raining and there and no one about, but I still recognized the gliders silhouettes on the field. 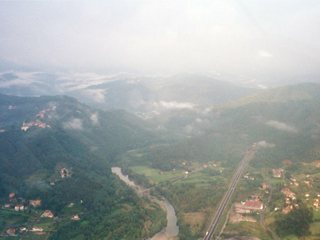 It’s a temptation to land in Alp and wait for a better weather but I was committed to do that trip in one day so I proceeded through the valley to Seo-de-Urgel flying in light rain with low visibility and high mountainous terrain all around. In this hostile area I tried to always have a good place to land in case of an emergency, fortunately the Sinus is the best glider in its class, and I am confident that most of the time I have at least one emergency airfield at gliding distance. I don’t really feel safe flying low unless over a landing place. It will be very rare or improbable to have all the air space free of clouds or weather between Italy and Portugal. If it’s good in one region it’s not on the other and especially in the Pyrenees and Alps, so it’s important to be sure every time that weather permits reaching a nearby airfield and not be closed in. 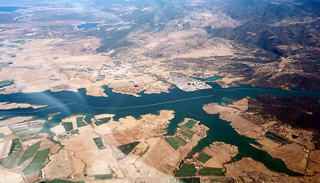 I have listed and researched more than 1000 airfields en-route, you could find a list for Portugal (160), Spain (380), France (600) and Italy (300) in my web pages. 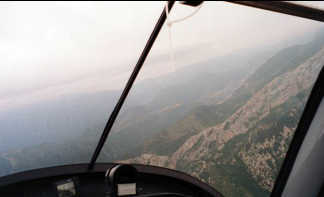 Leaving the dangers of low visibility back in Pyrenees, I faced increased wind speeds and strong turbulence. The terrain became a desert like plateau, as high as 7,000 ft. and I couldn’t go faster than 120-150kmh with a combined 50km head wind, that gives a very low speed across the ground. I spent more than 4 hours in a carrousel like mountain jumping up and down. 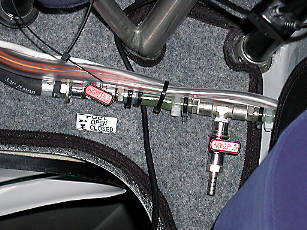 Between 2 p.m. and 4 p.m. the thermals were so strong that I could see more than 15m/s going up with motor at minimum. No time to profit from all that thermals I intended to arrive home that same day, what a bore! Even though I could go directly home I decided to do a little detour to a friends airfield near home to catch a drink, refuel and talk about my adventure, after that I arrived at my home airfield almost 11 hours after leaving Pontedera in Italy that same August day. This trip could be made in fewer hours if we had a day with less turbulence or the opportunity of flying higher, but for this trip I didn’t have a transponder installed to fly high and in controlled airspace. Maybe next time.